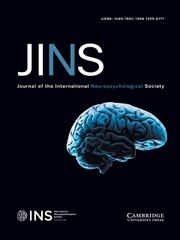 JINS is the official journal of the International Neuropsychological Society, an organization of over 4,700 international members from a variety of disciplines. Our editorial board is comprised of internationally known experts with a broad range of interests. JINS publishes empirically-based articles covering all areas of neuropsychology and the interface of neuropsychology with other areas, such as cognitive neuroscience. Theoretically driven work that has clinical implications is of particular interest. You can receive Continuing Education credit(s) for reading select JINS articles online. Earn anywhere from 1 credit hour for a single article, and up to 11 credit hours for reading select Special Issues. View available articles here.